So you're in the market for a sport touring bike. In all actuality, there is no single best sport touring motorcycle - no, there's just the best sport-tourer...for you. A great sport touring bike should be comfortable for long distances while still being a hoot in the twisties, and perhaps even on the odd track day excursion. As you know, most sport touring bikes are powered by re-tuned versions of a company's past or current sport bike engine. Modified crankshafts, flywheels, and other components make for smoother power delivery, better reliability, and more midrange power (versus peak output) than their superbike kin. Larger fairings make for better freeway cruising, as well as more comfortable ergonomics and often a shaft-drive in place of a chain and sprockets. Honda's VFR line of sport-tourers has received innumerable accolades since its inception in 1983 with the VFR750. The VFR1200F represents an all-design from Honda, and like VFRs, it's powered by a V4 powerplant. In this case, the 76-degree, 1237cc SOHC engine offers 149 rear-wheel horsepower. However, riders and reviewers have complained of an abrupt "on/off" throttle response. This is definitely on the sportier end of the touring spectrum than most of the other models on the list. Quarter mile speed is a tick under 10.2 seconds at nearly 135 mph, and the wail of the V4 excites praises from just about everybody. A praiseworthy ABS braking system brings this shaft-driven 590 lb (wet) sport-tourer to a halt. However, performance has seemed to get in the way of touring in this newest evolution of the VFR. The handlebars are actually lower than those of more singleminded sport bikes like the ZX14 and 'Busa, and the rearsets are quite high. Suspension is also quite stiff from the factory. Overall, this bike may be shaft-drive with hard luggage bags, but the engine, suspension, and ergos are very much SPORT-oriented - perhaps too much so for the sport-touring shopper. 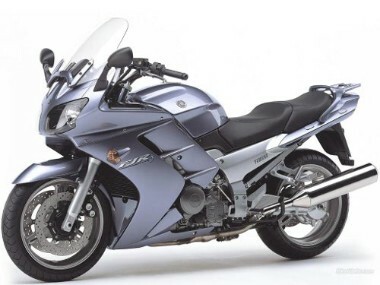 The Yamaha FJR1600 was first introduced in 2003 to broad acclaim, and became available with ABS brakes in 2009. The bike is heavier than the VFR (662 lb wet) and the 1298cc inline-four offers about 27-28 less hp. This translate to significantly less performance than the VRF1200F, with a 1/4 mile time of 11.1 seconds @ 119. That said, people don't buy sport touring motorcycles just for straight-line performance - not at all. The FJR1300 offers one of the most comfortable seats on the market for long distance touring, and both seat height and handlebar angle is ADJUSTABLE. This means you can really customize the ergos. The bike has a low and compact feel that is a blast in the twisties. However, the transmission offers only 5 gears - a sixth would significantly increase fuel economy. Overall, this bike is less sporty than the VFR, but offers a more well-balanced touring package. It retails for about $800 less than the Honda: $15,190. The 2010 Kawasaki Concours 14 offers a host of improvements over the older model, including a redesigned fairing, dual-mode ABS with traction control (optional), and an ECO engine mode to improve gas mileage. In terms of performance, the 689 lb Concours comes in right between the Honda and Yamaha with a 10.8 sec quarter mile and 136 rear-wheel horsepower. Reviewers have raved about a suspension package that performs well for both all-day freeway cruising and tight, technical twisties. The engine is smooth and potent, though the selectable "ECO" fuel map has proven to be rather unexceptional, hardly improving fuel economy. The Concours also retails for significantly less than the VFR or FJR, starting at just $14,599. If riders feel comfortable with the large size and heft of this bike, the Kawasaki Concours 14 may well be the best sport touring motorcycle for the money. It offers long-distance and two-up passenger comfort without sacrificing straight-line or canyon-carving capabilities. Click here for Kawasaki Motorcycle Insurance. None of these sport touring bikes could be called cheap, as the MSRP on all of them tops $15,000 to $16,000 by the time you add a few extras. If plan to finance your bike, just be sure not to get in over your head, especially if you don't have good credit. You might want to try and arrange financing before you head to the dealership; bank or credit union motorcycle loans often come with lower rates than those straight from your factory dealer. Remember that motorcycle insurance is the law in all but a select few states. All of these bikes are swaddled in large aerodynamic fairings - insuring your bike against collision, drops, and accidents would be a good idea. After all, you don't want to have to shell out 4 figures for new OEM plastics if you simply drop your shiny new sport tourer in the driveway. Check out the following site for low cost motorcycle insurance - you can compare insurers, as well as their policies, online!